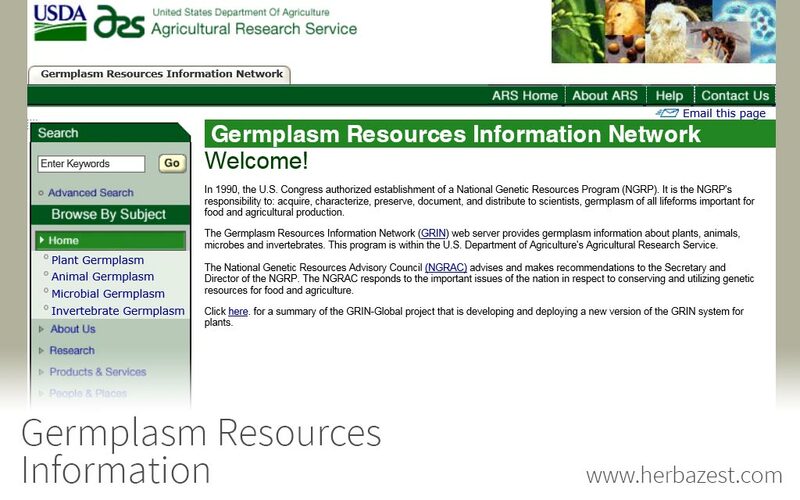 The Germplasm Resources Information Network consists of four USDA programs for plants, animals, microbes, and invertebrates. The National Plant Germplasm System provides taxonomical data on thousands of plant species, such as their classification, subspecies, and synonyms. In addition, each plant page contains information on the species' economic uses, range, and common names. The database includes links to images and helpful references as well. The Germplasm Resources Information Network is part of the USDA's Agricultural Research Service. It is connected to the National Genetic Resources Program, which was established in 1990. Its goal is acquire and document important information on all life related to food and agricultural production. Arnica, Taxon: Arnica montana L.
Basil, Taxon: Ocimum basilicum L.
Bilberry, Taxon: Vaccinium myrtillus L.
Blackthorn, Taxon: Prunus spinosa L.
Cacao, Taxon: Theobroma cacao L.
Celery, Taxon: Apium graveolens L.
Chives, Taxon: Allium schoenoprasum L.
Damiana, Taxon: Turnera diffusa Willd. Hemp, Taxon: Cannabis sativa L.
Licorice, Taxon: Glycyrrhiza glabra L.
Milk Thistle, Taxon: Silybum marianum (L.) Gaertn. Myrtle, Taxon: Myrtus communis L.
Peony, Taxon: Paeonia officinalis L.
Persimmon, Taxon: Diospyros kaki Thunb. Potato, Taxon: Solanum tuberosum L.
Self-heal, Taxon: Prunella vulgaris L.
Thyme, Taxon: Thymus vulgaris L.
Wild Yam, Taxon: Dioscorea villosa L.